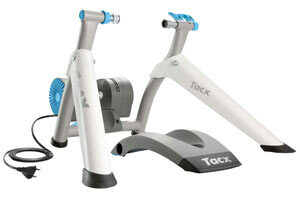 Tacx Turbo Trainer Reviews – Which Are The Best Models? 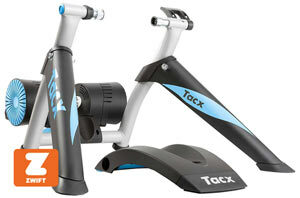 Thinking of buying a Tacx turbo trainer? If you're struggling to decide on the right model, here's an overview of the best Tacx trainers (smart and basic) depending on your budget. Turbo trainers have exploded in popularity in recent years - and Tacx has been a big part of that. The company produces a range of models depending on your requirements and budget. Whether you want a professional standard trainer with realistic road feel and high maximum power, or a basic trainer without smart features, there's an option for you. 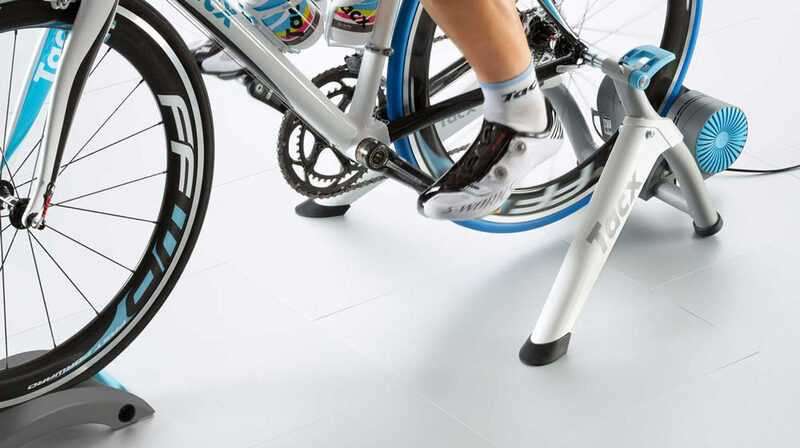 If you're looking for a wheel-on trainer with a high maximum power and realistic feel, the Tacx Genius Smart is a great option. It has a maximum power output of 2000W (at 40km/h) and incline of up to 20%, so it provides plenty of challenge for even experienced riders. As you would expect from a smart trainer, the Genius is compatible with all the major ​training apps via Bluetooth Smart and ANT+. These include Zwift and TrainerRoad, along with Tacx's own platform. One of the great things about this trainer is the wide range of factors it considers when calculating brake resistance. These include everything from air resistance to air pressure and wind speed, resulting in a realistic feel. It also does a great job of simulating descents. And, if you don't want to connect to Zwift, running the trainer in "basic" mode makes it function as a fluid/wind trainer (the resistance increases with your speed). There are some drawbacks to this model though. We think it's priced slightly too high, so look to buy it at a discount or second-hand if you want to get the most value for money. The software connection can also be temperamental, which is frustrating - although it's great when it works. In summary, if you want a professional-standard trainer but prefer wheel-on to direct-drive, the Genius is a brilliant option. It's not cheap, but the high maximum power, descent simulation and accurate power measurements make it worth the price. 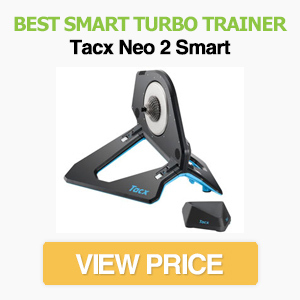 If you're looking for the best Tacx smart turbo trainer, the Neo 2 is the clear winner. It's a direct-drive model that improves on the already excellent Neo Smart, with improved pedal stroke analysis, upgraded components, left/right pedal power measurement, better memory and a more accurate cadence sensor. These features add to the Neo's existing features, such as descent simulation, near-silent operation, virtual flywheel, realistic road feel and dynamic inertia - and the result is impressive. Everything from wind resistance to changes in the road feel are simulated, so it's much more immersive than basic models. Of course, the biggest drawback to the Neo 2 is the price. With an RRP of around £1200, it's clearly targeted at high-level enthusiasts and professional riders. 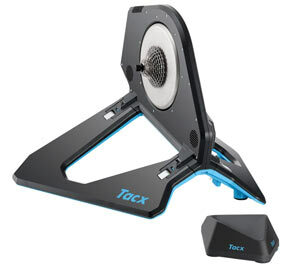 It also doesn't seem that Tacx has been able to fix the slight slipping when sprinting from a stationary start. This is only a minor issue though, and sprinting when already moving doesn't cause the same problem. Overall, the Neo 2 provides the performance and quiet operation you already love from the Neo 1, and adds some worthwhile extra features and improvements. It's a brilliant turbo trainer - even if it's not quite the revolutionary model some people were hoping. At the other end of the spectrum to the Neo 2, we have the non-smart Blue Matic. 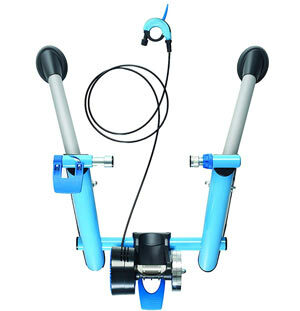 It's a basic wheel-on trainer that's available for a fraction of the cost - but still provides cadence sensors, quiet operation and a stable resistance. What does "basic" mean in this context though? Turbo trainers fall into two categories. Smart trainers have accurate power measurement and can send data to apps such as Zwift. They can also adjust resistance and incline according to what's happening in the app. In contrast, a basic trainer's resistance must be adjusted manually. They are much cheaper, but don't provide the interactivity and variety of a smart trainer. The Blue Matic is a basic trainer, but does allow ​cadence and speed data to be transferred to TrainerRoad, Zwift and other apps. It can't receive data to adjust its resistance, so it's a long way behind smart models, but it's still a step up from many basic models. If you want to dabble with smart training but without the high price tag, it could be a good option. Resistance is generated via a magnetic unit. This is relatively quiet, although it's louder than the Neo 2 and Genius. There are 10 resistance settings with a maximum of 700W, which is far less than professional-standard devices but enough for many amateurs.​ The Blue Matic also has a high build quality and seems stable even when you're sprinting - plus there's the option of folding it down to save space. It's worth pointing out the limitations of the Blue Matic though. There isn't a built-in power meter, so it relies on an algorithm to estimate power depending on resistance and wheel speed.​ This is much less accurate than a true power meter, but the readings are consistent, which is arguably the most important thing. If you want smart features on a budget, the Vortex Smart is a great alternative to the Neo 2 and Genius. It connects to all the popular training apps, such as TrainerRoad and Zwift, and the wheel-on design makes it easy to get started. Setting up the Vortex is straightforward. It has a Tacx skewer for bikes with QR axles, although you'll need an adaptor for thru-axle models which must be purchased separately. It connects to smart devices using either Bluetooth or ANT+, and the electromagnetic resistance is fully controllable by these devices (making the Vortex a true smart trainer). Like the Genius, it acts as a fluid trainer when not connected to a tablet or phone. This is a useful feature when you just want a quick workout or to warmup for a race - but it really starts to shine when you connect it to a workout app. ​Once connected, you can use it to take part in multiplayer races, workouts and personal training programs. Considering the relatively low price, it's a great entry into the smart turbo market. It's also considerably lighter than many other trainers. At just 9kg, it's more portable than direct-drive trainers, plus it has folding legs for extra portability. There's a downside to this lightweight design though: the light flywheel. At just 1.6kg, it doesn't have the "heft" of a more expensive trainer, nor does it feel as realistic. The 950W maximum power output also indicates that the Vortex isn't designed for the fastest sprinters. Even so, 950W is more than enough for most people, especially with a 7% maximum slope. Be prepared for some tyre slip when accelerating at high resistance levels though. To summarise, don't expect the interactive features, weight and immersive ride feel of trainers costing twice as much. But if you want an inexpensive trainer with true smart features, it's one of the best options. Note: If you're happy with an 800W maximum power and 6% incline, the Tacx Flow Smart is similar to the Vortex but at a cheaper price. Read our review here. Tacx turbo trainers are amongst the best on the market - but it can be difficult to know which to choose. With the company's wide range of basic and smart trainers, the options can sometimes be overwhelming.